FQB "MAN-ual Labour" Collection lets us warmly capture the hobbies of the men in our life! 1 Galvanized metal arrow - "Car Wash"
1 Galvanized metal arrow - "Man Cave"
1 Arrow journal card "Nothing is impossible..."
1 Red arrow element - "Crazy About"
1 Banner in navy blue - "Auto Specialists"
1 Banner in mustard yellow - "Ace Carpenter"
1 Banner - "Man Cave"
5 Blank journal strips for you to fill in your personalized sentiment, name, car model, cabinet build date, etc. 1 Vintage label - "Authentic Parts Company...."
1 Vintage label - "Dad's Workshop..."
1 Label - "Car Crazy"
4 Blank name plates with screws as holders....what will you say about your special man? 1 Name plate - "My Garage. My Rules." 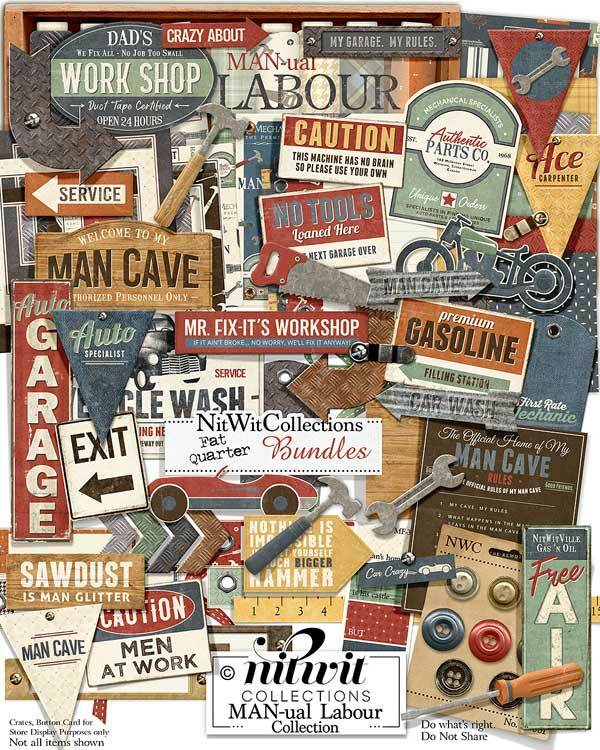 1 Sentiment digital stamp - "MAN-ual Labour"
1 Vintage sign - "Caution...Men at Work"
1 Wooden sign - "Welcome to my Man Cave"
1 Vintage sign - "Exit"
1 Vintage sign - "Service"
1 Vintage worn sign - "Auto Garage"
1 Vintage sign - "No Tools Loaned Here..."
1 Vintage sign - "Premium Gasoline" now why didn't we know about this gas station when we ran out of gas?? 1 Sign - "Mr. Fix-it's Workshop..."
1 Sign - "Caution...this machine has no brain..." there's nothing wrong with a little tongue in cheek in our scrapbook layouts and cards, is there?? 1 Wooden sign - "Sawdust is Man Glitter"
3 Tags that are perfect photo elements or to use behind other main elements...one is metal, one is in a wood look and one in denim - "First Rate Mechanic"
1 Vintage label including a vintage truck - "Vehicle Wash...."